Superbly played and recorded works from a driving force in Finnish music. (...) Hakola's present style is broadly tonal and incorporates elements from a wide range of styles, from the avant-garde to Hollywood-like sentimentality to oriental world music. It is a tribute to his compositional skill and the force of his creative personality that he is able to hold such a bewildering array together. (...) With demonstration-quality sound, this is all great fun. The Finnish Radio Symphony performs with remarkable panache and precision under Sakari Oramo's direction. (...) Ondine's recording (...) powerfully conveys the music's considerable dynamic impact. Kari Kriikku ist der schlichtweg phänomenale Solist, für den es scheinbar keine technische Schranken zu geben scheint. 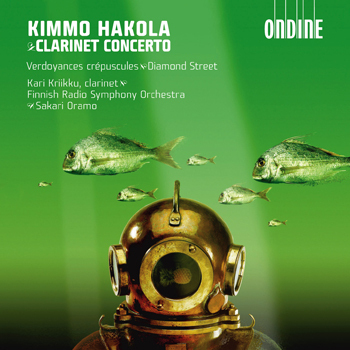 This CD includes Finnish composer Kimmo Hakola's Clarinet Concerto, a stirring and virtuoso work of nearly 40 minutes written for Kari Kriikku, the featured soloist. The recording also includes the solo clarinet piece Diamond Street, as well as the single-movement orchestral work Verdoyances crépuscules, which Hakola wrote on commission by the Finnish Broadcasting Company and features Esa Tukia on French horn. Sakari Oramo conducts the Finnish Radio Symphony Orchestra. Since the groundbreaking Capriole in 1991, written for the unusual combination of clarinet and cello (ODE 1102-2), Kimmo Hakola has written a number of works for clarinet, including a Clarinet Quintet and the solo piece Loco (ODE 960-2).